This soup is my idea of a natural cure-all, and to me, it’s perfect. 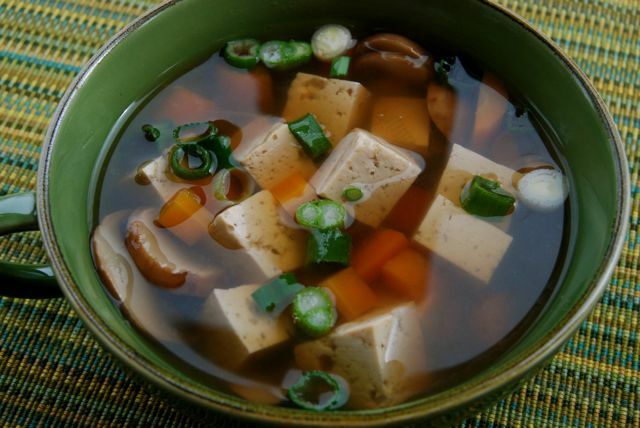 Filled with toothsome chunks of tofu in a broth that’s light and subtle, with a slightly spicy afterkick. Definitely one of the best soups I’ve ever created. Place all of the ingredients into a stockpot EXCEPT tofu, pepper and the last 2 scallions. Bring to a boil over high heat. Once boiling, reduce heat to low and simmer, covered, 15 minutes. Add the tofu, raise heat to high and bring to a boil. Once boiling, reduce heat to medium and simmer 8-10 minutes. Remove from heat, stir in pepper, and serve, garnished with sliced scallion.